Discussion in 'Custom Cases & Projects' started by ZombiPL, Apr 1, 2018. I'm very interested in the Sentry 2.0, but I don't like the "back pad" which you put on the case to "eliminate dead air" behind the GPU and support it in the horizontal orientation. My plan is to use a short GPU and an AIO water cooler for the CPU. The "back pad" restricts the height of the AIO radiator/fan. I would also drill some new ventilation holes so the AIO fan/radiator had proper ventilation on both sides. The "back pad" makes this impossible. Is there any chance the "back pad" is removable so I can accomplish my goals? Maybe you can shorten the "back pad" and pre-punch AIO radiator fan vent holes -- that would be fantastic!!!! It's not the "back pad" as you said that is restricting the height of the AIO + fan. It's the center rail designed around 2.5" drive thickness and centring the GPU in the case that is limiting factor. When we designed this feature, there were still three or four AIOs fitting within this limit including corsairs H75 that had 25mm radiator thickness specified on their page for quite a long time. Right now you can take any 27mm radiator and put deepcool GS120, an awesome 20mm thick 120 mm fan, or a 15 mm one from either noctua or silverstone. As for removing the piece from the cover - if you just tear it away, you might end up with ugly marks on the opposite side where it's welded to the cover. Also if you remove it along the tooth in the middle, your cover might not come together neatly. As for blocking the air when coming outside the AIO - it's actually helping thermal performance of the GPU this way by enforcing additional airflow in the GPU compartment. Talyrius and LeandroB like this. Campaign will last for 23 more days and up to 5.000 units, whichever comes first, right? Haven't ordered yet, just to make sure I definitely have time till the end of April (in case number of ordered cases is lower than 5.000). You are right. You have time to make your order within next 23 days or before we gather 5000 units order (first deadline is more probable). Talyrius and zustroy like this. Thanks for the reply! I took a closer look at the center rail, and I understand the problem! I think the air coming off the radiator is pretty warm, so I'd rather send it out of the case. the air coming off the radiator is pretty warm, so I'd rather send it out of the case. It's not. This is something many people don't get. If you get fresh air directly from the outside and it' gets through the radiator, it's actually heated just slightly by few degrees or less. If you can exhaust this air, then it's not a problem. Problem is when you start recycling this air around the cooler, you're heating it up more and more and then it gets pretty warm. If you have such AIO mounted inside your system, then in many cases the hot air coming through it will actually be pre-heated by the internal components, and just the fact that your AIO is working as an exhaust fan for all of this is making it feel like it's heating up it so much. Anyway, it's definitely better to help push the heated air from the back of the GPU with barely heated air that came fresh from the outside through the radiator, than let the back of the card keep that warmed up air in there. That's actually helping in horizontal orientation. For vertical orientation, the effect may be smaller, but it won't really hurt the performance of the card. Talyrius and loader963 like this. Okay, I did some quick heat calculations. If the CPU is putting out 120W of heat and the fan is pushing 35 cubic meters / hr through the radiator, the temperature increase of the air will be 10C. This seems fairly significant. Anyway, I'm not worried about GPU cooling. The GPU has its own fan and access to fresh air from the case vents. My concern is CPU cooling as you can probably tell from my assumption of 120W of CPU heat. It seems to me the best way to cool the CPU is with a reasonably thick radiator and fan system with clear air access in and out of the case. One thing is that this case is not aiming to accommodate 120W TDP CPU. The fact that we have stuff like 9900K pulling so much power and pushing so much heat is the effect of intel not having other options to counter 8-core amd CPUs. If 16-core AM4 cpus launch, we'll see how they look in terms of TDP, but for now 105W TDP of 2700X is absolute top we'd recommend and going for OC on that might be a bit too much. Anyway, the GPU has it's fan on one side, but back of the GPU is not cooled because in standard/reference ATX layout you always have at least CPU cooler moving air at the back of GPU (it's usually in the closest slot to the CPU). So the air is heated by the back of the card, and any airflow is better than no airflow. At least for now, we won't be redesigning the air inlet to let AIO full pass-through config. For Sentry 2.0 it's too late to update design and it wouldn't be fair to people who decided to back the campaign based on the reviews to do any significant changes, both because of the basis for their decision and the fact that it would delay the production significantly. As for future improvements, the current layout with AIO config is specifically designed this way for you to be able to make a reasonably performing horizontal config for a living room, where CPU cooling isn't loud and the AIO helps cool down 180W ITX-sized GPU like 1080/2070 Mini. If you still want to push the case to the limits, then it's okay, it's your choice, but what we're trying to achieve is not a chassis that's going to handle absolutely ultra-high-end hardware, but introduce a reasonably balanced form factor that can compete functionally with a console in the living room. By going overboard with the CPU you might end up with diminishing returns on your investment. 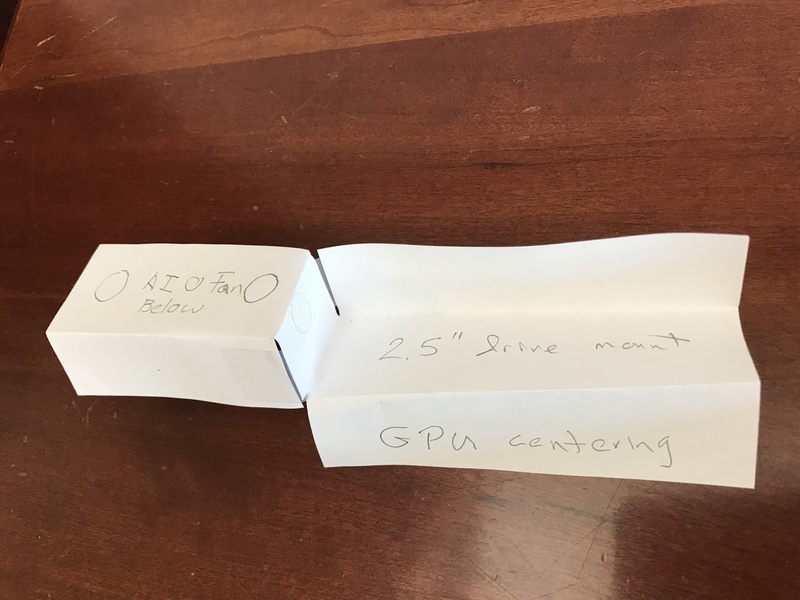 I know the design is finalized, and I am no engineer, but if air is pulled through the radiator into the case and exhausted through holes behind the fan, in theory (correct me if i'm wrong): There will be a direct air channel, in which air will flow with higher velocity (relatively), therefore the pressure will drop, theoretically pulling air from the gpu to equalize pressure. Of course even if it did work, it would ruin the design aesthetic and the "air pocket" would be less efficient with big gpus. That's correct, but as I said before - the point here is to make this fan work both for the CPU and GPU in horizontal orientation. We know that this affects cooling performance for the CPU, in contrast to what you'd get with no obstacles, but at the same time the use case for the AIO here is to make it quiet, and not to run an extremely power hungry CPU. Talyrius, loader963 and skiphix like this. @SaperPL If acoustics is a concern, then please demo the Yate Loon D125M-12C. It is a battle-tested 20mm fan. At similar RPMs, it performs just as well as the GS120. I say similar RPMs because the GS120 can spin faster than the Yates; 1800 vs 1500 RPMs. But that higher top end comes at a cost. Acoustics. For a good comparison point, get both the Yate and GS120 installed and use PWM control of the GS120 to bring it down to the same speed as the Yates,,, say 1500 RPMs, Then, put them through their paces and just listen. I found that - at 1500 RPMs - the GS120 performs no better than the Yate, but it is significantly louder. Yate yeet. Thanks for this info. Actually I've been looking through PWM fans only, I believe there's a thread on [H] that has a spreadsheet of most of slim fans, but there are not all of them there so I went through multiple vendors to look for what they have on their websites and found GS120 this way. My only annoyance with it is that stupid separate wiring that makes it harder to handle in SFF. Congrats on hitting the goal. Looking forward to my Sentry! Talyrius, LeandroB, nph84 and 2 others like this. Talyrius, SaperPL, LeandroB and 2 others like this. LeandroB, Talyrius, talkion and 2 others like this. Thank you for considering us x99/x299 group. For myself, I have a Asrock X99e ITX with a 2660v3 and tdp of 105W. I think option 1) and 2) will work for that board. I installed the t318 in the DAN Case with a NF-A9x14 blowing inside and have a 40mm blowing out of the I/O Shield. I tried opton 3) for the x99e-ITX and I'm not able to mount the Narrow ILM Kit from Noctua to that cooler. For some people: Keep in mind you'll get that kit for free at the Noctua support if you have a cooler that would fit on that narrow ILM socket. The retention Kit works for almost all Asetek based AiO coolers. How did you get T318 on a AM4 Socket? Are there special mounting brackets? I saw dondan from dan Cases ttalking in one forum aobout that but I can't find the post anymore. With that said, I couldn't do the same thing on asrock board because of the VRM components. 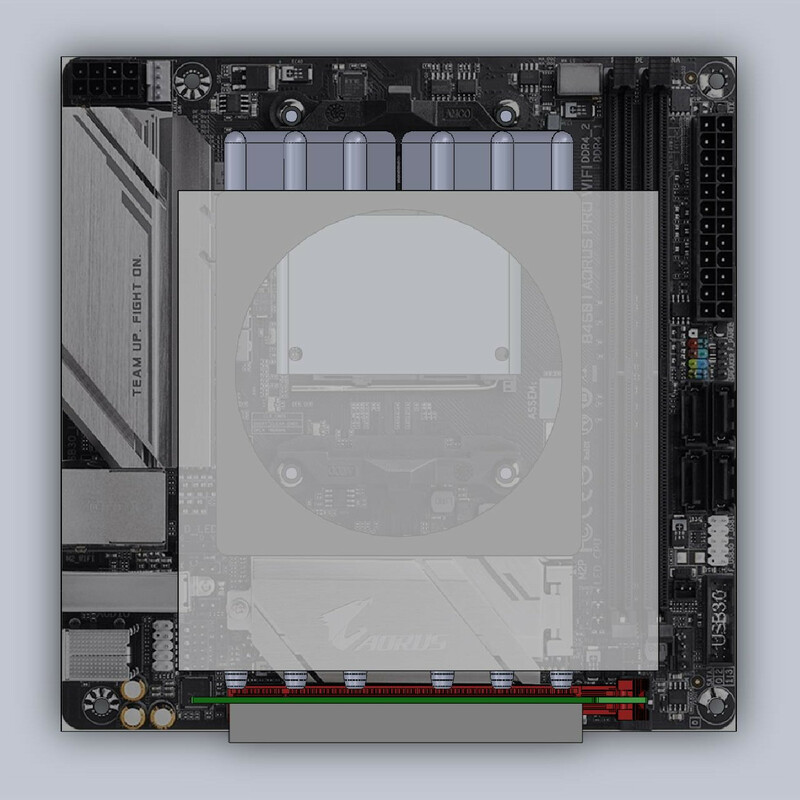 Also on the biostar board, the cooler is slightly shifted away from the center of the socket by the VRM components. Hi, this is a question moreso in my case about the Sentry 1.1, because I don't yet own 2.0, but I think it's relevant because I'd assume they both use the same vertical stand. I regularly transport it to my girlfriend's house to play on LAN with her computer. One of my Sentry's rubber feet seems to have fallen off at some point. I didn't notice it until a couple of days ago, so it honestly could have happened at any time. I checked the bag that I transport it in, and of course, it's not there. Can't find it anywhere. I assumed, apparently wrongly, that there is adhesive holding these on. I checked the other feet, and alas, they slip right off with almost no effort. I guess I'm going to get adhesive to adhere the remaining three. I'm not rough with this thing, but given these slide right off, I'm not surprised I lost one at some point. Anyways. I need a replacement rubber foot. Can anyone tip me off on where to purchase more? I emailed the Sentry team-- No response yet. We have your email, and you will get answer about your particular situation, but it takes time. Every day we are receiving many emails, and sometimes we just can't answer to everybody within 48 hours. We are replying to emails according to the order in which we received them. Sometimes we get 10-20 emails and you will get your answer faster and sometimes we are processing more of them, and you just have to wait. Right now we are in campaign for new Sentry 2.0, and we are receiving a lot of emails, and it takes time to answer properly to them (as you know, we don't answer with just 'yes' and 'no'). Probably in the evening you will get your answer. Please be patient. p.s. Sentry 2.0 uses different stand than Sentry 1.1, so this is a wrong topic for your question. Thanks. Not trying to be a nuisance. I know how this goes. Just need a little help. I intend to purchase 2.0 just like I did the last one. It's just a major eye sore to me to lose a rubber foot on any case, and didn't know where to go for help.